While there are psychological reasons (Innovators dilemma et al) behind it, I also see that there is a lack of understanding in all the elements that are needed to lead a company closer to its destination. At the same time, I see a lot of suffering from employees, teams, CEOs, founders and managers that it simply is not possible to to „what we want to do on the market“ or „what we know we should do“. Instead, we do what’s possible. I came to this conclusion while I wanted to describe a system to manage portfolios. But while trying to describe portfolio management – which will soon come up as a next exercise – I came to find some preconditions that need to be met to manage a portfolio in a meaningful way. To motivate and ground this on real life observations, here are some situations, in hoping that some of them might sound familiar to you (or rather not!). You are dependent on a team that has other priorities, so that what you need from the team will find a way into this team in 4 sprints? You have no clue why what you are doing right now is contributing the the larger picture? Why is this deadline a deadline? You think that important opportunities for the future are not followed? That all you are working for is the current business and there is no activity on innovation? You have no insight in how what you are doing helps the client? Agility was practiced for years, teams may be agile but there is no application for it. Any of these issues is connected to missing one of the following structures needed in a company that does not simply want to do „business as usual“ but follow a purpose. Many of what I describe may be clear and sound trivial. What is important is that it is all there and interacts – and we’ll come to that later. 1 – Purpose & Vision: How do we see the future world? Every company was born with a purpose. To build any company needs endless energy from the founders. What drives the founders is an idea, an opportunity to change things into a direction they consider important. Sometimes that idea is made explicit, sometimes not. If the purpose is not made explicit, what we see are companies that „do stuff“ in any way. The task is that a) there is a clear purpose („We as a company are there to help … so that …“) that is b) made explicit, c) relentlessly communicated and d) as relentlessly used in arguing for or against things we could and will do. The vision is a description of how the world will look like when we either have fulfilled our purpose or came closer to that fulfilment. Purpose and vision are quite stable. Apple Computer Inc. changing its name to Apple Inc. in 2007, 31 years after being founded, is a well known expression of a company changing its purpose and vision. That happened in 2007 – 31 years after its founding. 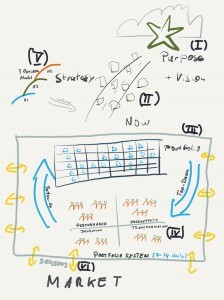 2 – Strategy: How will we get closer to the vision? Strategy defines the currently most likely way (and plan) how we think we will come closer to fulfilling our purpose or reaching our vision. Strategy is really a high level plan to get there. As it is so abstract and seemingly intangible, there are ways to talk about strategy in meaningful ways. 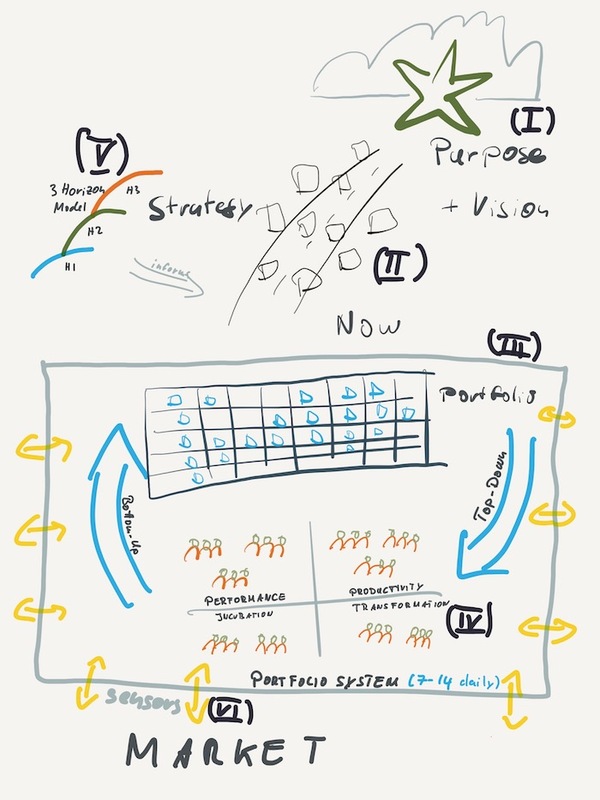 Especially the tool of mapping as „invented“ by Simon Wardley helps to discover, discuss and make explicit why certain strategic movements make sense and others less. While continuously being re-analysed and re-thought, strategies get adapted, but not really that often. 3 – Portfolio System (Strategy Deployment): What exactly are we doing and what not and why? Once a company has a high level plan – the strategy – to fulfil its purpose, obviously the strategy needs to be operationalised, transformed into actual work, that is hopefully aligned. That means people have to work according to that strategy so that things happen. While there is lots of talk of how this can be done, at the core it means to lead a company. And, of course, there are meters and meters and tons of literature on how to do that. In the end, where companies fail to be excellent is exactly here. The task is to come up with things to do, choose the right things to do, explain why exactly these things should be done and so on. The task is to come up with the next level of granularity for „the plan“. And this is also where things get a little complicated. On the other hand, this is simply the work we have to do. And I like to keep things simple, especially here. Bottom-up keeps us moving, innovates, keeps us nimble and is raw energy. When we talk about team level agility, we talk about the bottom up force. By implementing traditional team level methods like Scrum and Kanban (as it started out), we give teams – and thus bottom-up – power. Everything new is good, everything old is stupid and boring. That alone does not help and this is where top-down steps in. Top-down tries to regulate, give boundaries, preserve (direction). What was is good, what is new is challenge and risk. The portfolio is where all friction in the company sits in one room and fights about the few resources we have. One party wants to serve his client right now, the next one wants to achieve its next OKR which is three months ahead, another one wants to build a new business that will pay our checks in five years time. The task and challenge is to come up with a realistic high level plan, in which top-down gets its right to steer the company in the right direction(s) while having empathy and understanding for the raw power and the level of detail in the bottom-up movement. And the other way around. What is needed is a „process“ of continuous communication horizontally and vertically. Here Hoshin Kanri comes to mind, in which all levels and employees are involved in creating the plan to reach the next goals. Without going into details in this article, I achieve this by having highly frequent meetings with everyone necessary in front of a huge board. If possible this all happens in one room. To give everyone needed in these meetings an opportunity to attend, we have found ways to keep that meeting short, concise and to the point. „Everyone needed attends“ means that indeed everyone we need – no matter which level – to contribute information will attend that to that exact meeting to come to an informed and well understood decision. most people do not have to attend every time. On first sight this seems like a lot of effort, but as I said, we found ways to get that done. Easily. Second, whatever communication we miss out on that level, will be much more expensive later on. In most cases this communication can not be replaced afterwards. Remember: Here is the place what we do when and why. The leverage of any communication here os incredible. A reason why companies going into agile fail on this level is that the frequency of the portfolio process (if explicitly existent) is not adopted to the requirements of teams that are now spinnig faster and need decisions or done resets of boundary conditions much quicker than before. („We already know this makes no sense.“ „We could already do XYZ, but there is no decision yet.“ „We would already go into a different direction, but the project charter clearly states …“) The more decoupled the cadences of portfolio planning and team planning are, the bigger the pain on all sides. 4 – Zones & Teams: How do we organise to achieve the different goals? People need to do the work, which is why we operationalised our strategy. And for people do to good work and engage in their work, they need to be informed on the why and what. Also, they need to be informed on the boundary conditions of their work and changes of these. This is necessary for any delegation. Auftragstaktik comes to mind. Where agile transitions often start is at the team level: Lets have all teams agile. The question is, of course: Why? And: really? Does every team, every department have to be agile? Maybe! Sometimes! But, how do we know? Well, it would be nice if our strategy and our portfolio decisions would tell us why and where this important. Say, you are in a highly regulated banking environment in which the customer is an alien to the inside organisation. And the task of 50% of your teams is to move all of your backend systems to real Basel 3 conformity. Or your way is to extend and upgrade the damn SAP systems. Or to integrate that new CRM system. Other parts of your business might be a better place to start agile. Places where the task is to transform your company towards a future of new offerings and services which are not yet clear. Where you know the problem to solve and attack, but you don’t yet know how to get it done. And, yes, agile might also help in other areas. But that is not the core of agile. Thus it is hard to change (team) behaviour when the motivation is fuzzy. OK, we need teams. Some of them agile. Here, a whole world of org design opens up: Feature teams vs. component teams, constant teams vs. dynamic teams, teams organised around outcome … Anyway: Any thoughtful design is ok. Without going in depth, these teams have different goals, thus need to work different, be measured different and need to be governed differently. A clear distinction of the purpose and direction of teams is important. The old and lazy, unthought through „any team will do anything“ will not help. Most companies have no such concept and also no concept of teams in different zones at all. 5 – Sustainability (3 Horizons): How do we care for our future? Horizon 3: Discover new options for future growth (to be placed as H2 bet), discover future categories. The first problem of most companies is to stick to H1 to protect the current line of business. Once they discover that new business needs to be generated there are no concepts and ways of work available how to do this. The idea that completely ways of working and governing are needed is alien. The romantic idea that everyone and each team can be successful in all these areas is nice but not true. Most companies need years to discover this, if at all. The next problem is even if the difference between horizons is discovered it is not made explicit and operationalized. The then next problem is that putting a new H3 option into H2 (transformation zone) is counter intuitive: We do this with few options, ideally just the one best option. The one big bet. This is because this one big bet to be successful, it needs to „steal“ resources from H1. That again means, we can not place a „portfolio2 of H2 bets, because each and everyone of them will die. We need to pull one through. Latch onto it, commit and pull through all the way. Until we either see vectors of success or failure. H3 again is completely different and you can think of small independent internal startups with tight, tangible „milestones“ as a good model (validate the problem and feasibility, create 10 customers, create scalability beyond 1000 customers while maintaining margins, etc.). We want many options here. The end result of them being a rare H2 transformational bet, killing them off, pivoting to something else based on research findings, selling them out, etc. 6 – Supporting functions, grounding & sensors: How does the world see us, what do people need from us? On top of it all, we need some of the supporting functions beyond their internal tsk. We need User Research, Marketing, Sales ans everything else that is outward facing as a sensor network for our company to stay grounded. We need them to give constant feedback into all levels on what the worker looks like. We do not necessarily react on all levels at all times, but e need constant input. It is the source of grounding and empathy and thus self consciousness of a company (are we seen as what we want to be?). What happens if an element is missing? I am writing this because in my observation it is crucial that every element exists. Let’s go through any scenario where one of the elements is missing. If we see a company as an intentional organisation that wants to impact its environment any of the following symptoms keeps us from doing something o the market with intent. Take the smallest example: The CEO together with marketing and a research team has found a great opportunity for a new App on the market. If the strategy is not clear, we can not evaluate that option. If the portfolio process is dysfunctional, there is no way to get to done in time. If the teams are not „agile“ enough“ they will either not get it done in time or are shocked by facing the uncertainty of technology or requirements of the new opportunity. What we want is the company, in which we discover new opportunities – huge and small – all the time and always have the right tools at hand to realise the best ones – align to our purpose and strategy. The point is: WE WANT!!! Intent! Well, nothing makes sense now. Everything is opinion. There will be no reasoning possible on what initiative makes more sense than any other. It is like a map without compass. We continuously move. But is this the right direction? The way we go might be nice … but is it where we want to be? As everything is of same value, discussions make no sense, work packages make no sense and everything is just effort. Undirected. If you ask employees, the north star, the vision, the reason to be is what they desperately seek for. As people need some kind of a plan, they will come up with an implicit plan if no plan exists. It might just not work. We need strategy, a high level plan, to align all energy in the company in the same direction. All clarity that is missing on this level will cause millions of discussions and meetings (!) on the operational levels of the company. Without operationalising the strategy, teams will do what they want. The plans we come up with will neither be understood nor well executed. And no one is to blame. Without communication top-down to bottom up, plans can not to be understood. Without communication bottom-up to top- down, the plans are ungrounded, make no sense and con not work. Without lateral (horizontal) communication, teams are not aligned amongst each other and flow between silos can not exist and thus hinder work. Dependencies will kill you. A model of how we work does not exist and teams are in confusion. Teams will be assigned on tasks and goals they are not designed to fulfil and have no understanding of. Let week it was quality, now it is exploration? There will be war between teams that have to try radically new things and those who have to sustain the companies core business. Innovation will be killed. Creative people and people who seek challenges in new opportunities will be dissatisfied and leave the company. Horizon 2 and 3 will collapse. It is hard to maintain work on all three horizons. New things won’t happen without us taking care. New ideas won’t be pushed to market, even if they exist. Innovators Dilemma. The company becomes delusional, is not self concious and decoupled from the market and the customer. No sensible feedback is possible (or taken serious) on any level of planning and designing. As a side note: while that I describe here is a certain hierarchy and „process“ it is still quite vague and does not make any assumption on the structure and hierarchy of the company. in place – all of them. Agility needs to be inserted from the desired intent in top-bottom planning and needs to be realised by the directed power of bottom-up forces. A successful company will need to balance top-down and bottom-up in a well thought out process of portfolio planning where top-down steers while accepting bottom-up need and bottom-up energy does, respecting alignment by the north star in the strategy. By WANTING the right products, services, supporting projects etc. again and again, we can shape the company and pull the required agility in the places where needed. In this case, we can motivate changes in ways of work such as „becoming agile“. Without pulling agility with good reason, agility remains bleak and hollow. By designing and living a portfolio system at the core, management has the chance to live agility first rather than ordering agility unmotivated in random places and thus signal how serious they are.